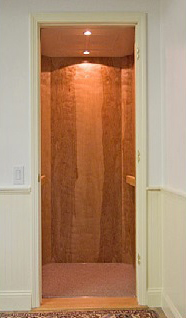 Welcome to Hoyt Residential & HOME ElevatorS! Finally, with the installation of a home elevator, you can enjoy the benefits of having unlimited access in your own home. Hoyt Residential and Home Elevators in Mass are designed for new construction, retrofits, residences, apartments, condominiums, elderly and handicap accessibility. We are the only home elevator manufacturer in Mass and custom-manufacture our residential and home elevators in Mass from high quality parts and materials built to our precise manufacturing standards. Look to your family's future. The stairs that make your living space so convenient today may eventually become an impediment tomorrow. Why endure the cost and inconvenience of moving when you can have a safe, efficient multi-level home elevator installed quickly, cleanly and professionally? Unlike other residential elevators or home lifts, Hoyt residential and home elevators are designed for your home from the ground up, rather than re-configured from commercial construction applications. Our home elevators can be installed directly onto the 1st floor or basement slab with no need for a damp pit often situated below the normal water table. The entire elevator unit fits within the confines of a simply framed shaft and needs only 98" headroom above upper level. Click here to see our residential elevator video to see how easy our home elevator installations can be! Please contact Hoyt residential and home elevators in Mass to see how we can help provide you with an affordable residential elevator and enhance the quality of your life. We currently work with expert, licensed and insured home elevator installers in Massachusetts, New Hampshire, Maine, Vermont, Connecticut, Rhode Island, New York, New Jersey, Delaware and Pennsylvania, and we are expanding our service area continously. Click here to contact us and thank you for choosing Hoyt Residential Elevator! Hoyt Residential & Home Elevator / Plum Island Design, Inc.
© 2015 Hoyt Residential & Home Elevator. All Rights Reserved.